Canada Post scored a goal of its own by revealing a new stamp celebrating the most beloved sports of the country. 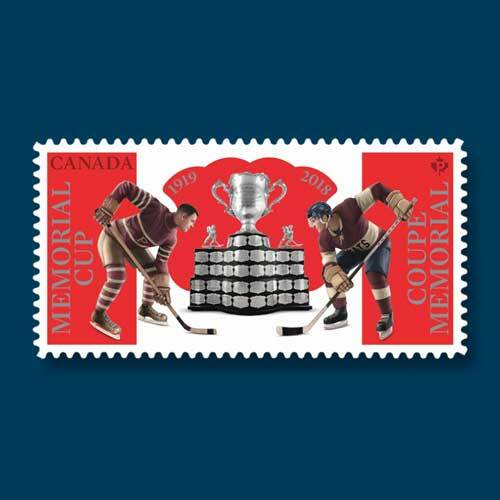 Canada commemorates 2018 Mastercard Memorial Cup Championship junior ice hockey tournament on a brand new Stamp. Illustrated by Louis Hebert and designed by Paprika, a graphic design and strategic marketing firm based in Montreal, Quebec, the stamp also celebrates the centenary of the tournament. The trophy was donated by the Ontario Hockey Association in March 1919 in remembrance of the Canadian soldiers who died in World War I. The stamp features two hockey players a hockey player from the good old days, facing off against a modern-day player. The players on the stamp hail from the Regina Pats, a team that competed in the first Memorial Cup against the University of Toronto Schools in 1919. The stamp comes with the price of 85cent and adores the colours of Canada’s flag in the background.